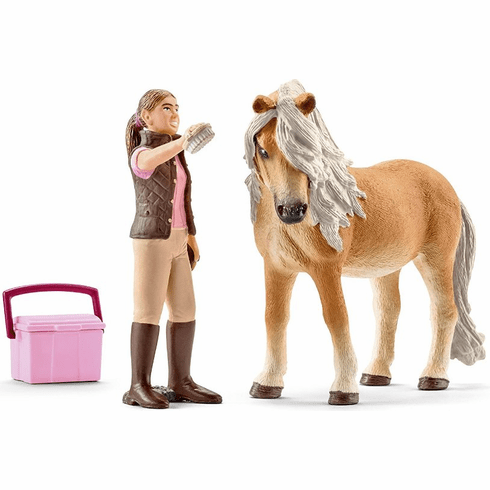 Schleich Groom w/ Icelandic Pony Mare. Icelandic ponies need plenty of exercise. That�s why the Icelandic mare stays on the pasture all year round. Even extreme weather is no problem for a breed as robust and durable as Icelandic horses. But the groom still regularly checks the ground to make sure that it is safe and that there are no branches or objects that could be tripping hazards. She also regularly checks her horse�s hoofs for cracks. However, Icelandic ponies are generally very robust and durable, meaning the groom always has a little free time for a pleasant ride in the countryside after all her work.